January | 2015 | The Intraracial Colorism Project, Inc. The Colorism ListServ has launched! The purpose of the list is to share information about events, programs, discussions, websites, links, articles, news, calls for submissions, research, dissertation research, project updates, and other information pertaining to colorism, race, societal issues, etc. Subscribers can submit content, etc. to the list which will be sent to subscribers. via The Colorism ListServ has launched!. You may also subscribe to the ColorismListServ by visiting the Intraracial Colorism Project’s website and selecting the Colorism ListServ page. 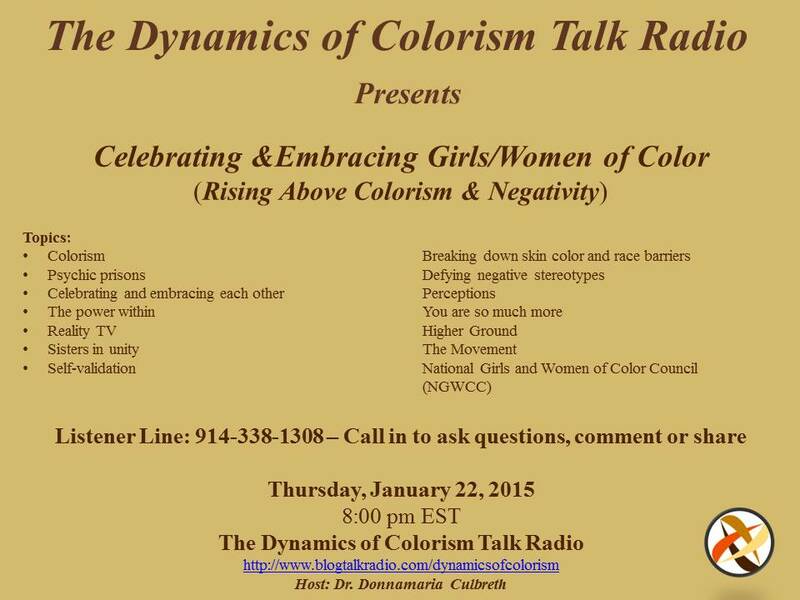 Celebrating & Embracing Girls/Women of Color: Rising Above Colorism & Negativity: A Movement. Join Dr. Culbreth, Dr. Jung-Kim and guests for Celebrating & Embracing Girls/Women of Color: Rising Above Colorism and Negativity. We started the conversation in 2013, wrote about it in 2014 and invite you to join us as we start the movement in 2015! Be a part of the change – in unity! Journal of Colorism Studies – Call for Submissions. We will also accept book reviews (books about girls and women of color). To submit manuscripts for review, please register at http://jocsonline.org (you will be required to create a user name and password). Review the Submission Guidelines and then submit your manuscript. Bridging the Gap Between Academia and Communities of Color. 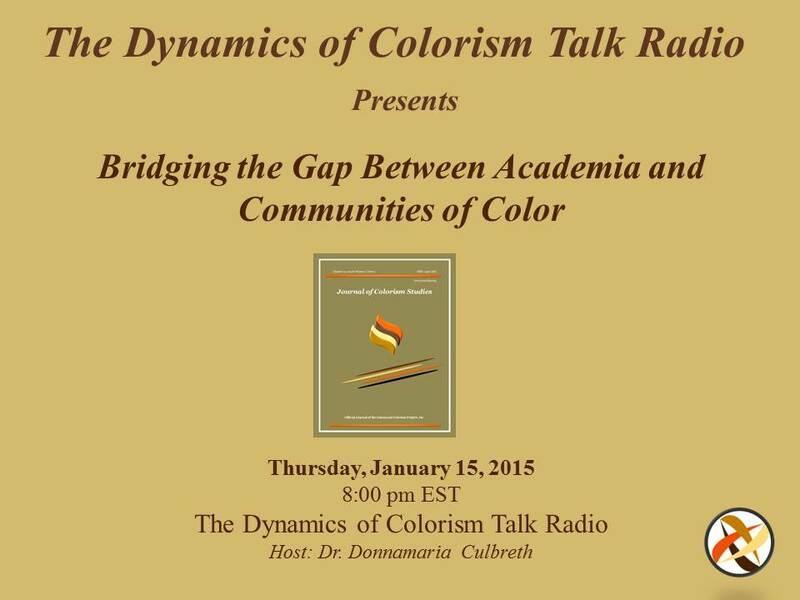 Join Dr. Culbreth for thoughts on bridging the gap between academia and communities of color. The Journal of Colorism Studies (JOCS) Published Volume 1, Issue 1.